Good afternoon everyone. Mainitong maayong hapon kanatong tanan! This is an auspicious and happy occasion for us all. Most specially, it is a major milestone in your young lives. It’s definitely a day worth celebrating. Let us acknowledge and give thanks to those most close to you, the loved ones who made this day possible, who supported you through the years, who were with you through your ups and downs. And this day being a special day, can we ask all the proud mothers to please rise. Happy Mothers Day! Can we ask the fathers, grandparents, spouses, significant others, and other loved ones to please rise. This is your day as well. May I ask all candidates for graduation to please rise and face your parents and loved ones. It is a good day to show your appreciation and gratefulness knowing you would not have reached this far all by yourself. As I was thinking about what to say to you today, I thought of many things. Do I give you a “to do” list? Do I tell you “how to succeed in life without really trying”? Then I said to myself, these guys are ready to go, to blaze their own trail, to conquer the world, to be the best that they can be. I am confident that your four years or so here in Silliman would have prepared you for life outside of the comforts of the campus. The university would have molded you into persons of competence, character and faith anchored on the Gospel of Christ – whole persons with a heart, mind and soul for others. Thanks to your mentors, professors, classmates and friends. Can we ask all deans, pastors, faculty and staff present here today to rise? This is your moment too. When I left this beloved campus so many many many years ago, I thought that was it. I’d be gone and be done with Silliman. I’ll go and make something of myself, explore, grab opportunities that’s available and just treasure the learnings I got here in Silliman. For many years, I did that – I worked, made new friends, I studied some more while holding a full-time job, and on to more work, work, work. Silliman was just a small blur in the horizon. And then, the opportunity to serve came. So after so many years, here I am again, back in the campus by the sea. All those years, what was the thing that kept playing in my mind? Something that made coming back a no brainer? Believe it or not, it’s our Silliman Song. It’s like an LSS – last song syndrome – that kept on reminding me of happy times here in the campus. How many of you here have memorized this song? How many have internalized its meaningful lyrics? It might not strike you yet now, but as you move on with your life, leave this campus, and pursue your dreams, you will realize how true and how beautiful this song is. There is this nice anecdote of how this song saved a group of Sillimanians. The story goes that they were visiting Sulu and had no place to stay. Then they thought there might be a Sillimanian in this faraway place. So, they asked around and true enough they were told and directed to a house nearby. As expected, the house was locked and bolted and the owner refused to open the door. Then they started singing the Silliman Song and voila, the gates opened and the lady owner came out crying saying it’s been years since she heard the song. It goes without saying, they had a comfortable place for the night with a sumptuous meal to boot. So keep it in mind. It might come in handy one of these days. When Sillimanians gather anywhere in the world, more often than not, everyone would heartily sing along once someone breaks into the first strains. It’s the tie that binds us. 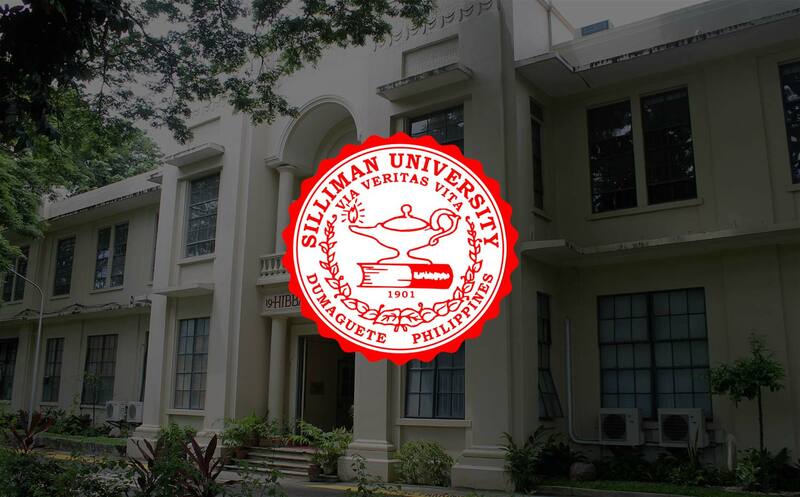 The thing that reminds us of home, that calls to mind the ever present Silliman Spirit. It still rings true today, 99 years after it was written in 1918 by Dr. Paul Doltz, then the vice-president of Silliman Institute and pastor of Silliman Church. The tune of the song is an adaptation or modification of “The Orange and the Black” of Princeton University, Dr. Doltz’s alma mater. The white sands and the coral might not be there. Or “palm trees with branches” waving in the breeze might not be a scientifically accurate description. But we lustily sing and take it to heart. It evokes happy days in college – in the classroom, the court, the field. Such a vivid description of life here in the campus. Something like a dream that we wish will keep on going and will never end. But walang forever. So here we are today. You are about to leave the campus, make a life for yourself, roam the world o’er near and far. For some, you might go on to pursue further studies, prepare for the board or bar exams, apply for work, or start a business, or join your family business, or get married and start a family. Speaking of bar exams, I’m especially pleased with the results of the latest exams. Three – 3 of our graduates landed in the top 10. What an amazing feat for our young lawyers, my paneros and paneras. Congratulations to them and to all those who made it this year. This goes to those who made it in other licensure examinations as well. I share your pride and honor for their distinct achievement. Then we move on to the last stanza of Silliman Song. If there’s one thing I want you to take to heart – it’s this line in the 3rd stanza – “still the faith and truth she gave us, will remain our guiding star.” It’s the line that gives me goosebumps all the time. There will be challenges, difficulties, bumps on the road ahead, times when you doubt your capability. You will be faced with temptations. There will be times when your principles or morals will be challenged. So, do you give in? Compromise? Or walk away? When I myself was faced with trials, fears, or difficulties, this was the line that led me to the right path, as my guidepost, as my north star. And I’m referring to our enduring “Via, Veritas, Vita” in the gospel according to John 14:6 – “Jesus said, ‘I am the way, and the truth and the life. '” It made choices easier to make. It cleared my mind and my conscience knowing that I made the right decision. “Do not accumulate for yourselves treasures on earth, where moth and rust destroy and where thieves break in and steal. But accumulate for yourselves treasures in heaven, where moth and rust do not destroy, and thieves do not break in and steal. For where your treasure is, there your heart will be also. What is important to you – Is it money? Fame? Recognition? Praise of others? Or in this age of Facebook or Instagram, more likes on one’s posts, or posts going viral? So often we look at the things of this earth and say to ourselves “If only I had that, then I’d be happy and fulfilled” Let me ask you – Where is your treasure? Where is your heart? Are you enthralled with the temporary versus the permanent? Material things that the moth or rust will destroy, or thieves will break in and take away? Think about it. Or you can lay up eternal treasures that do not fade away. By living the way God has asked you to live and following Him in all that you do. By loving the Lord your God with all your heart, soul, mind and strength, and loving your neighbor as yourself. This is a good one. You’re all familiar with this story in the Bible about a rich young man. It’s found in the gospel according to Matthew 19:16-22. A rich young man comes up to Jesus asking how he may have eternal life and Jesus tells him that all he needs to do is obey the commandments. He then asks “Which ones?” and Jesus replied, “Do not murder, do not commit adultery, do not steal, do not give false testimony, honor your father and mother, and love your neighbor as yourself.” The young man said to him, “I have wholeheartedly obeyed all these laws. What do I still lack?” Jesus said to him, “If you wish to be perfect, go sell your possessions and give the money to the poor, and you will have treasure in heaven. Then come, follow me.” But when the young man heard this he went away sorrowful, for he was very rich. It’s about treating everyone – whether a superior, a subordinate, or a peer, or as the Silliman Song says “or in high place or in lowly” – treating everyone with kindness, graciousness and care, the way we would like to be treated in return. It’s loving your neighbor as yourself. As Apostle Paul says to the Corinthians, in 2 Cor 9:8, “And God is able to make all grace overflow to you so that because you have enough of everything in every way at all times, you will overflow in every good work.” Just remember, His overflowing grace grants you a life full of hope and promise. And so, my dear graduates, Godspeed and may the grace of God be with you all. Congratulations!